Oppo R17 and Oppo R17 Pro New Year Edition Launch, Know Specifications - mobilereview.online - The Ultimate resource for mobile phones reviews, specification, information. 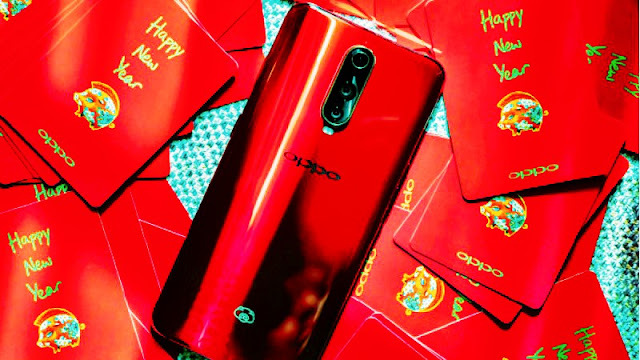 The handset maker Oppo launched Oppo R17 and Oppo R17 Pro New Year Edition. There will be no visible changes in the specifications of both the handsets. Oppo R17 and Oppo R17 Pro New Year Edition will come in a new incarnation, which will show the Piglet logo on the back panel. This new variant of Oppo R17 and Oppo R17 Pro New Year Edition will come in red, also appears on the back panel with a gradient effect. The smartphone has a new New Year theme UI. Oppo R17 New Year Edition price in Chinese market is 2,799 Chinese yuan (about Rs 28,900) and Oppo R17 Pro New Year Edition costs 4,299 Chinese yuan (about 44,400 rupees). Both smartphones will be available in 8 GB RAM and 128 GB storage variants. The sale of these handsets will start from December 2018, ie, December 21. These devices are exclusively launched in China, so they are less likely to be launched in India. Remember, the price of Oppo R17 is 3,199 Chinese yuan (about 32,600 rupees). This price will get 6 GB RAM / 128 GB storage. The 8 GB RAM / 128 GB storage variant costs 3,499 Chinese yuan (around Rs 35,600). The price of fog gradient color option is 3,599 Chinese yuan (about 36,600 rupees). In China Oppo R17 Pro is priced at 4,299 Chinese Yuan (about 43,800 rupees). At this price you will get 8 GB RAM / 128 GB storage variants. As we told you earlier, there was no change in the specification of both the smartphones. The Dual SIM Oppo R17 Pro New Year Edition will run on ColorOs 5.2 based on Android 8.1 Oreo. The smartphone will have a 6.4-inch full-HD + (1080x2340 pixels) display, with 19.5: 9 aspect ratios. This is Amoled Screen and has a Waterdrop Design in it. There is a protection of Corning Gorilla Glass 6 on the display. The Qualcomm Snapdragon 710 Octa-Core Processor is offered in the smartphone. 8 GB RAM / 128 GB storage will be available. There are three rear cameras on the back of the phone. A sensor will be 12 megapixels, whose incarnation is 1.5-2.4. The second sensor is 20 megapixels, whose incarnation is F / 2.6. The third sensor is TOF 3D Stereo Camera. Rear camera setup comes with optical image stabilization, dual pixels, PDAF and ultra-night mode. The phone has a 25-megapixel front camera with F / 2.0 aperture. The Oppo R17 Pro New Year Edition will have a 3700 mAh battery that will come with superwoke technology. The connectivity features include 4G VoLTE, Wi-Fi, Bluetooth 5.0 and GPS / A-GPS and NFC support. The smartphone's dimensions are 157.6x74.6x7.9 millimeters and its weight is 183 grams. Oppo R17 Pro will have an in-display fingerprint sensor. Oppo R17 New Year Edition with Dual SIM 8 GB RAM with Qualcomm Snapdragon 670 processor. Oppo R17 has 128 GB of inbuilt storage. There will be a dual rear camera setup with LED flash on the back panel, with a sensor of 16 megapixels second sensor of 5 megapixels. For Power Backup, Oppo R17 will get 3,500 mAh battery. Other specifications of Oppo R17 are similar to Oppo R17 Pro.